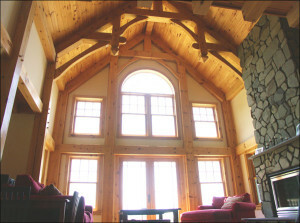 The first thing I wondered about a Crockett Timber Frame Home® with a 20-foot cathedral ceiling in the great room would be how high the heating bill would be during a harsh Cheshire County New Hampshire winter. The Homeowner was proud that not only can they swing the heating bill, they now have more money to spend on themselves. She researched extensively many cost-saving measures that can be a part of the design and she was happy that Crockett worked with her to achieve her dream. First, she explained to me, geothermal energy for heating and cooling is a less expensive alternative to other more traditional energy sources such as oil or propane. A geothermal heat pump moves water from the ground into a heat exchanger that lowers the water’s temperature and exchanges it to heat energy. The same technique is used to cool the house. 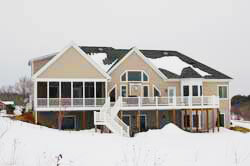 In the summer months, the system captures the heat inside the home and moves it back to the ground. It takes only one kilowatt-hour of electricity for a geothermal heat pump to produce nearly 12,000 BTU of cooling or heating. She said that the only regular maintenance needed for the system is cleaning the air and water filters, and it’s much cleaner than burning oil or gas. She was excited that the initial investment in the system will pay for itself in five years and save money overall. According to Public Service of New Hampshire, a geothermal heat pump can deliver 30 to 70 percent less in monthly cost savings than a typical heating bill for a 2,000-square-foot home. Furthermore, she explained, the rewards of building a green home stretch even further than helping the environment and overall energy cost savings with energy incentive programs offered by Public Service of New Hampshire. A geothermal pump and 5-star Plus rating Energy Star certified home earns a discount for the homeowner. She told me that energy-saving features that are part of an standard Crockett Material Package include the use of Low-E Argon windows to reflect wanted heat which would otherwise be wasted (as it is with less-efficient windows) back into the room and they keep unwanted heat out. Low-E Argon windows offer a 65 percent improvement over regular insulating glass. Low-E glass minimizes drafts found near many windows by reducing convection currents caused by temperature differences between the inside and outside of the window, and it reduces condensation by maintaining a more even temperature on the interior glass pane. The argon gas between the glass is much heavier than air, making it more difficult for warm or cold air to pass through. A Crockett Ultra-R SIP (Structural Insulated Panels) home has its insulation built in. Crockett’s R-24.3 walls and R-38 roof contain eco-friendly oriented strand board with expanded polystyrene sandwiched between for less leakage, creating a “tight,” energy-efficient home that will save all Crockett homeowners money in energy bills for years to come. Heat and cool air stay in when you want it; air and moisture from the outside are unlikely to penetrate inside the home. She really went all out adding to the list low-flow showers and toilets, Energy Star appliances, and compact fluorescent light bulbs in all fixtures, and much more. 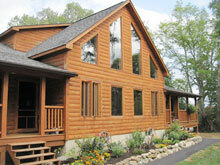 The green picture for her Crockett Timber Frame Home® is complete.